e-Commerce stores often want to highlight a particular product or products. This can because they have new products to promote, special offers, stock to clear – or just because they believe it will help conversion. While the popular Virtuemart e-commerce system will let you mark products as “On Special”, it doesn’t offer an out-of-the box way to highlight these special products on the main shop pages. 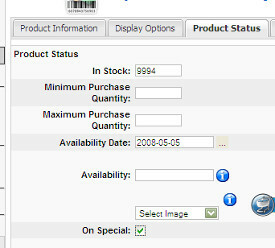 The standard Virtuemart functionality allows you to set a product as “On Special” – as the image below shows. Unfortunately, this information about your products isn’t available to your theme, so you can’t style your products differently, nor can you sort them to the top of your list (As most designs would require). The first thing we need to do is make sure that the details about whether the flag is set or not is pulled back from the database. The file we’re interested in is shop_browse_queries.php which is in administrator/components/com_virtuemart/html/. Line 39 specifies a variable called $field_names, so we need to add the database field product_special to this list, e.g. 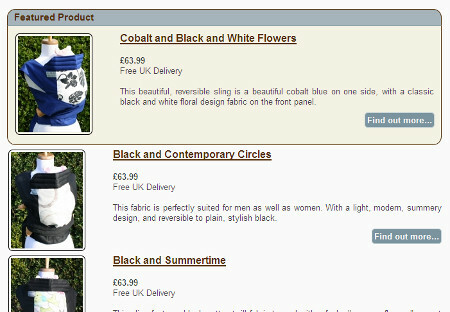 We then need to make sure that this information is added to the product array available to the layout code. If you want to see the final result, check out the SnugBaby Baby Carrier pages. As a quick update to this post – I’ve submitted a patch upstream to the Virtuemart guys so hopefully this will be included out-of-the-box in future. This implements all of the above, plus some small changes to the standard browse page templates. You’ll have to tweak your own Virtuemart templates to get the look you want obviously! Can something like this be done with discounted products; and new produkts. The product creation date is already pulled back by the exi disting queries, so to flag “new” products, all you’d have to do would be to check the cdate in your browse page template, and add CSS/HTML as required. I don’t think the existing queries pull back whether the product is discounted (product_discount_id > 0 if the product is discounted), but you could follow the same approach from this article to add the field, pass it through, and check for it in the browse page certainly. But it only works correctly if the site language is in English, in Portuguese it doesn´t work. I think that may be something related to strtotime. I’d do the date comparison on the MySQL server, and return it as a field. So – you probably want to amend the SQL in shop_browse_queries.php, to get a single field containing the age of the product, and then just check that in PHP. I can’t help much beyond that really as I don’t have the time to set up foreign language installs etc. but that should point you in the right direction. What about Virtuemart 2? How to make it in new version?